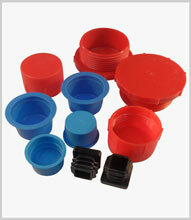 Blanking plugs and screw caps for sealing ends of round and square tubing or holes in components as protective ends or sealing against dust, waste and liquids. Plugs and caps may be temporary for protection in production, e.g. in machining or transit – or may be permanent components, e.g. in furniture.